A SIX-GOAL haul by Brent Harvey has helped North Melbourne stave off a resurgent Melbourne, with the Roos emerging five-point victors in a thriller in Hobart. At a windy Blundstone Arena on Sunday the Kangaroos won 21.10 (136) to 20.11 (131) but the scoreline didn't do justice to an all-time great tussle and a stoic effort by the Demons. Such was the free-scoring nature of the match, the 267-point aggregate set a new record for scoring in all AFL matches played in Tasmania, eclipsing the previous record of 245 points set by Hawthorn and Port Adelaide in Launceston in 2012. But despite the record high scores, the result came down to the wire with Dean Kent kicking a goal for Melbourne in the final 30 seconds that took the Demons to within five points of victory. Billy Stretch then had a snap from about 30m as the siren sounded, but it went through for a behind that in the end didn't count because it came fractionally after the siren. Harvey was a standout for the white and blue, with 22 disposals along with his crucial goals. "He just keeps going," Kangaroos coach Brad Scott said of the 412-game veteran. "We were actually talking during the week that someone said Boomer has only kicked five, or five is the highest he's kicked previously, and I found that really surprising because I would have thought he'd kicked some real bags in the past before. "I'm guessing he's kicked three, four and five on a number of occasions but I'm not sure of the numbers." 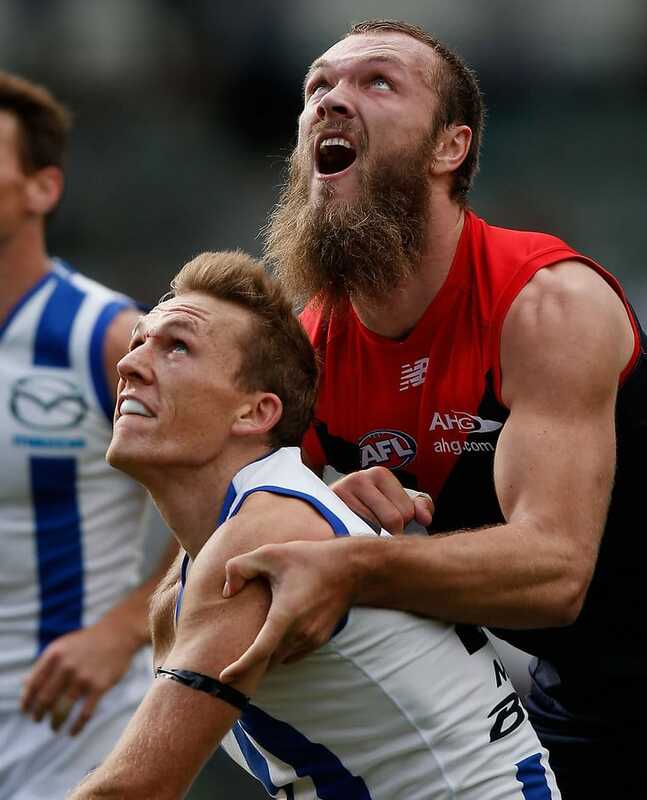 Harvey found support from Todd Goldstein, who finished with five goals and 38 hit-outs to arguably edge a titanic struggle with Demons' ruckman Max Gawn. "How do you split them?" Scott said. "I thought they were two of the best players on the ground. Gawn was terrific in the contest. Goldy was terrific outside the contest. "You've got a ruckman who's kicked five, it's a pretty good result." The game went all the Roos' way in the first quarter as they raced away with seven wind-assisted unanswered goals, including a huge 70m-plus bomb from Jack Ziebell. By the first break the Kangaroos boasted a 36-point lead, with Goldstein's three-goal contribution alone swamping the Demons' total. But with the breeze in its favour, Melbourne flew from the boxes in the second term and by the main break had a seven-point lead. The third quarter brought the true battle as each team shared in the free-flowing, high-scoring play, but the Roos narrowly took the upper hand with an 18-point margin at the final break. Dean Kent was a standout for Melbourne in the final quarter, with three goals and four overall. Ruckman Gawn, who had a remarkable battle with Goldstein, finished with 63 hit-outs while Bernie Vince was excellent through midfield with 32 disposals. Demons coach Paul Roos was clearly proud of his side's valiant effort and believed the group had shown character to bounce back in such a manner following their round two loss to Essendon. "We're all about improvement … from round two to round three we improved significantly against a high-quality opposition that has played prelim finals the past two years," he said. "Overall it's a pleasing day but you don't win and that's where the frustration comes in." North Melbourne: Jack Ziebell was able to shake off a heavy bump that left him seeking assistance for a right shoulder complaint during the third term, finishing with 19 tackles. Taylor Garner wasn't as lucky, damaging a hamstring in the final term to sit the game out on the bench. Melbourne: The Demons return home with a clean bill of health after their gutsy performance in Hobart. The Kangaroos host the Dockers at Etihad and will be eyeing off a 4-0 start to the season as well as the chance to poor more misery on Fremantle's stuttering start to the season. Melbourne have a real chance to build on Sunday’s performance against the misfiring Magpies in a crunch match at the MCG that will leave the loser starting down the barrel of a 1-3 record.